The consequences of inbreeding have been well studied in a variety of taxa, revealing that inbreeding has major negative impacts in numerous species, both in captivity and in the wild; however, as trans-generational health data are difficult to obtain for long-lived, free-ranging species, similar analyses are generally lacking for nonhuman primates. Here, we examined the long-term effects of inbreeding on numerous health estimates in a captive colony of ring-tailed lemurs (Lemur catta), housed under semi-natural conditions. This vulnerable strepsirrhine primate is endemic to Madagascar, a threatened hotspot of biodiversity; consequently, this captive population represents an important surrogate. Despite significant attention to maintaining the genetic diversity of captive animals, breeding colonies invariably suffer from various degrees of inbreeding. We used neutral heterozygosity as an estimate of inbreeding and showed that our results reflect genome-wide inbreeding, rather than local genetic effects. In particular, we found that genetic diversity affects several fitness correlates, including the prevalence and burden of Cuterebra parasites and a third (N = 6) of the blood parameters analyzed, some of which reflect immunocompetence. As a final validation of inbreeding depression in this captive colony, we showed that, compared to outbred individuals, inbred lemurs were more likely to die earlier from diseases. 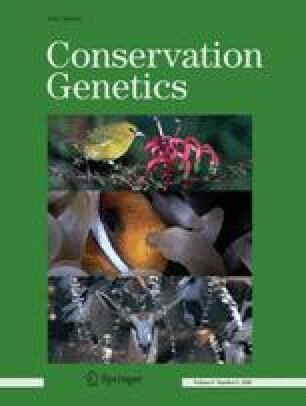 Through these analyses, we highlight the importance of monitoring genetic variation in captive animals—a key objective for conservation geneticists—and provide insight into the potential negative consequences faced by small or isolated populations in the wild. The online version of this article (doi: 10.1007/s10592-007-9499-4) contains supplementary material, which is available to authorized users. An erratum to this article is available at http://dx.doi.org/10.1007/s10592-015-0799-9. We are grateful to the staff of the Duke Lemur Center, particularly D. Brewer, K. Glenn, D. Haring, B. Hess, J. Taylor, and S. Zehr for animal handling and sample collection. We also thank J. Pastorini and J. Peeler (Henson Robinson Zoo) for providing DNA samples. We are also grateful to I. Fiorentino for providing advice on genetic techniques and to S.C. Alberts for providing laboratory resources. Finally, we thank K. Bleby and F. Prugnolle for their helpful comments. This research was supported by N.S.F. grant (BCS-0409367 to C.M.D.) and a Marie Curie outgoing fellowship (to M.J.E.C.). This is DLC publication #1123.